Euripides was a Greek playwright (one who writes plays or dramas) whom Aristotle (384–322 B.C.E.) called the most tragic of the Greek poets. He is certainly the most revolutionary Greek tragedian (one who writes plays based on human tragedies and conflicts) known in modern times. Euripides was the son of Mnesarchus. The family owned property on the island of Salamis, and Euripides was twice married (Melito and Choirile) and had three sons (Mnesarchides, Mnesilochus, and Euripides). 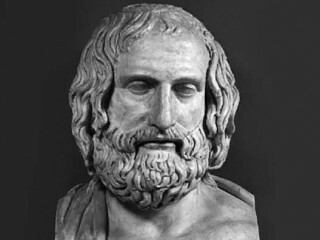 Euripides was raised in a cultured family, was witness to the rebuilding of the Athenian walls after the Persian Wars (wars fought between the Greek city-states and the Persian Empire during the first half of the fifth century B.C.E. ), but above all belonged to the period of the Peloponnesian War (431–404 B.C.E. ; a war fought between two ancient Greek city-states—Athens and Sparta). Euripides has been described as the most intellectual poet of his time. He has been called the philosopher (a person who studies for and seeks knowledge and wisdom) of the theater. In addition to his literary talents, he is said to have been an excellent athlete and painter. Euripides was well ahead of his times, and though popular, he irritated people in his own day by his sharp criticism (judgment) and won only five dramatic prizes during the course of his career. He is supposed to have owned a library and to have spent a great deal of his time in his cave by the sea in Salamis. Nothing about Euripides's military or political career is known. Toward the end of his life he stayed briefly in Thessaly (at Magnesia) and at the court of King Archelaus in Macedonia, where he wrote his masterpiece, the Bacchae. He died in Macedonia and was buried at Arethusa. The Athenians built him a monument in Athens. Euripides completely refined and popularized Greek tragedy (plays with unhappy endings) and was responsible for making tragedy something experienced by ordinary citizens. At the time of Euripides, the upper classes were the only ones represented on stage as worthy of serious consideration. Though he used the traditional form of the drama, he had some very different things to say, and he said them in a language that was much easier to understand. He used many everyday expressions. He was the first to introduce heroes in rags and on crutches and in tears. He treated slaves, women, and children as human beings and insisted that nobility was not necessarily a quality of social status. Euripides was a serious questioner of the values of his day. As a realistic person, he often placed modern ideas and opinions in the mouths of traditional characters. Euripides also wrote about religion, revenge, and all-consuming love. Euripides treated myths sensibly and expected men to use their logical powers. All of his existing plays are concerned with three basic themes: war, women, and religion. He investigated the social, political, religious, and philosophical issues of his day, and he truly loved Athens and sympathized genuinely with suffering humanity. Euripides's existing plays (except the Cyclops ) can be divided into three basic categories. The true tragedies include Medea (431 B.C.E. ), Andromache (early in the Peloponnesian War), Heraclidae (c. 430 B.C.E. ), Hippolytus (428 B.C.E. ), Hecuba (c. 425 B.C.E. ), Suppliants (c. 420–419 B.C.E. ), Heracles (c. 420–418 B.C.E. ), Trojan Women (415 B.C.E. ), and Bacchae (c. 407 B.C.E. ). The tragicomedies (plays that include tragedy as well as comedy) include Alcestis (438 B.C.E. ), Ion (c. 418–413 B.C.E. ), Iphigenia at Tauris (414–412 B.C.E. ), and Helen (412 B.C.E. ). The melodramas (dramas with strong emotion that usually end happily) are Electra (c. 415 B.C.E. ), Phoenician Women (c. 409 B.C.E. ), Orestes (408 B.C.E. ), and Iphigenia at Aulis (c. 407 B.C.E. ). The Alcestis was presented in 438 B.C.E. and is the earliest of the Euripidean plays that was preserved. A tragicomedy, it has a happy ending and has fascinated critics for countless years. Medea is perhaps Euripides's most famous and most influential play. In Medea Euripides demonstrates that "hell hath no fury like a woman scorned," and he scolds his fellow men for mistreating women and particularly for treating foreign women as less than equal. But perhaps even more brilliantly, Euripides shows that man is both rational (sensible or reasonable) and irrational (without reason), and that the irrational can bring disaster when it gets out of control, and that a woman is defenseless to passions. Hippolytus shows clearly Euripides's concern about claims of religion on the one hand and sexuality on the other. The Trojan Women is typical of Euripides's war plays. Euripides's Electra beautifully illustrates realism (the thought based on the belief that reality exists outside of oneself) and rationalism (the belief that reason is the main authority in controlling one's actions and thoughts). The Bacchae, Euripides's masterpiece, is well thought-out and is a very powerful play. In it he is again showing how the irrational, when not recognized and properly restrained, can get out of control and destroy all those around it. Euripides managed to call his countrymen's attention to the many obvious abuses and wrongs in his own society. He subjected all to a harsh but reasonable examination; however, he was basically tolerant and understanding and fully sympathized with the troubles and suffering of humanity. View the full website biography of Euripides.